Greece boasts over 5500 different species of plant, making it one of the most biologically diverse nations in Europe. The mountains, lowlands, and dry regions each have special balances of plant life, though many of the forests of southern Greece have been cut down to support the boating industry. Since the country does not receive much rainfall annually, the plants endemic to Greece have evolved adaptations that make them hardy and drought-resistant. 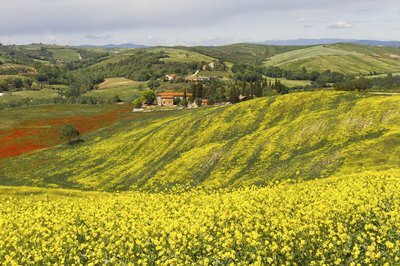 Picturesque photos of Greek scenery often feature the rolling hills covered in wildflowers in the spring, as this is one of the most beautiful sights in Greece. The flowers begin blooming in March and remain in bloom until the scorching summer weather arrives in late June. Home to over 100 different types of endemic orchid, Greece is also known for its primroses, peonies, anemones, tulips and violets. Flowers play a role in Greek mythology as well; for instance, the narcissus, and hyacinth flowers both represent men whose identities were placed into a flower, and poppies represent Morpheus, the god of dreams. 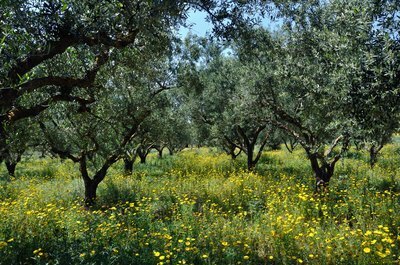 The olive tree is one of the most important plants in Greece because of its usefulness in cooking, but also as a lubricant or as fuel in lamps. Unfortunately this plant, though native, has been grown in huge tracts to harvest the oil, which allows soil erosion and can damage plant diversity. Another interesting Greek tree is the Judas tree, which has the unusual trait of growing flowers before growing leaves. In northern Greece the native forests still exist with a mixture of deciduous and coniferous trees, depending on which mountainous forest you visit. Beech, chestnut, cypress, poplar, pine, and aspen are among the 200 different species of tree native to Greece. Plants that are especially oily or aromatic have the advantage of tasting too strongly for most animals to want to eat, yet they are perfect for being ground up and used for cooking. Greek cooking is known for the use of herbs endemic to Greece, such as oregano, sage, rosemary, thyme, lavender and a type of curry plant. The oily surface of the herbs' leaves helps retain moisture, which has allowed these plants to survive in the dry regions of Greece where long droughts are common.